Oslo, May 15th, 2018 — Acon Digital has released version 2 of their acclaimed DeVerberate plug-in for reverb reduction. While earlier versions of DeVerberate successfully focused on the suppression of late reverberation, typically the diffuse reverb tail arriving 20 to 30 milliseconds after the direct sound, the first reflections to arrive after the direct sound were left untouched. These early reflections change the tonal character of the recording and can cause the hollow and disturbing sound frequently experienced when recording in small reverberant rooms. 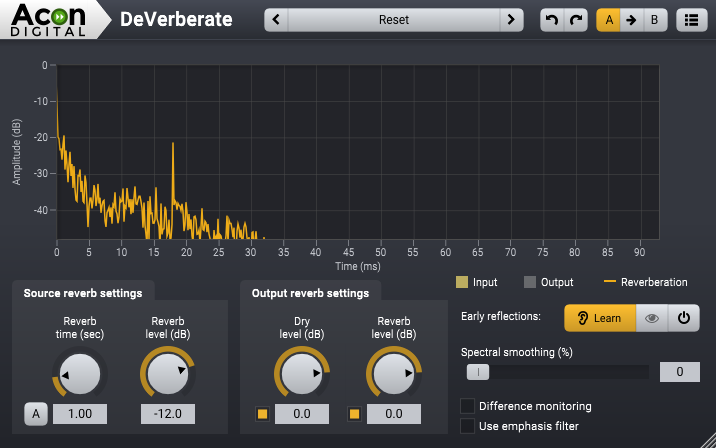 Further improvements have been made in the automatic reverb time estimation which now works more reliably than in earlier versions. If you are interested in reviewing Acon Digital products and need NFR licenses, please send a short request to press@acondigital.com.